This style of shibori began during the time of Nagoya Castle’s construction in the late 16th century. A small portion of cloth is pinched and bound tightly to prevent the dye from seeping in. 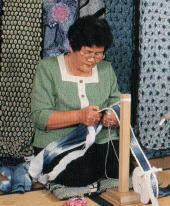 More than one hundred ways of shibori techniques are used to create elegant and refined designs.